Summary and Definition: The word 'Sputnik means "fellow traveller" in Russian, but has become synonymous with 'satellite' in modern Russian. Sputnik was the name of the first artificial satellite to orbit Earth and was launched by the USSR on October 4, 1957. Sputnik I was the first of a series of three Russian artificial satellites sent into orbit around earth during the late 1950s. Sputnik-1 was launched by an R7 Semiorka rocket, weighing 184 lbs, with a diameter of just 23 inches across. Sputnik-2 carried Laika, the first dog in space and was launched on 3 November 1957. Sputnik-3 was designed to conduct scientific experiments in space and launched on May 15, 1958. Sputnik I is the most famous of the Sputniks and terrified the American public as the satellite made an orbit every 96 minutes and became a constant reminder of Soviet space supremacy. The Sputnik-I satellite was in orbit around the earth for three months after which time it burned up in the atmosphere. The launch of the first Soviet satellite began the Cold War Space Race and prompted the establishment of NASA (National Aeronautics and Space Administration) . The first artificial satellite successfully launched by the United States of America was Explorer 1 on January 31, 1958. Fast, fun facts and Frequently Asked Questions (FAQ's) about the Sputnik. What was Sputnik? The name Sputnik was given to three artificial satellites that were launched by the Russians into outer space to orbit around the Earth. What does Sputnik mean? The meaning of the Russian word 'Sputnik' means "fellow traveller". When was Sputnik launched? Sputnik-1 was launched on October 4, 1957. What was Sputnik 1? Sputnik-1 was the first artificial satellite that was launched on October 4, 1957. It consisted of a small, glistening aluminum ball with four long antennas. The diameter of the sphere was 22.8 inches (58 cm) and it weighed about about 184 pounds (83 kg). It traveled at about 18,000 mph. Sputnik 1 is the most famous of all the Sputniks because it marked the entry of mankind into space. What was Sputnik 2? 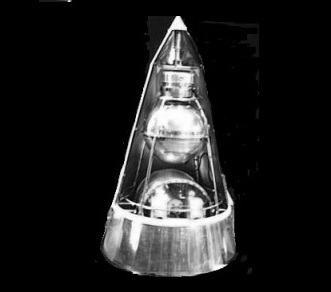 Sputnik-2 carried a "part-Samoyed terrier" female dog named Laika in a small separate sealed cabin. Sputnik 2 was the second spacecraft launched into Earth orbit, on 3 November 1957. It was a 13 foot (4-metre) high cone-shaped capsule with a base diameter of 6.6 feet (2 meters) that weighed 1120 pounds (508.3 kg). What was Sputnik 3? Sputnik-3 was launched on May 15, 1958 and was designed to conduct scientific experiments in space. It was cone shaped and was 11.7 ft (3.57 m) long and 5.68 ft (1.73 m) wide at its base. It was the heaviest satellite weighing 2925 pounds (1,327 kg). What happened to Sputnik 1? Sputnik-1 revolved around Earth for three months before being consumed in the atmosphere on January 4, 1958. Definition: A satellite is a celestial object in outer space that orbits around a planet or a star. The word 'satellite' derives from the French word meaning 'follower' or 'hanger-on'. The Earth is a satellite of the Sun. An artificial satellite, such as Sputnik, is a man-made device that is designed to be launched around the earth or another planet. Artificial satellites are now used for research, communications, navigation and weather information. The following fact sheet contains interesting information, history and facts on Sputnik for kids. Sputnik Facts - 1: Sergei Pavlovich Korolev (1907 - 1966) was the Soviet Union’s premier rocket engineer and the Chief Designer of the Sputniks. Sergei Korolev is credited as the founder of the Soviet space program and after the success of the Sputniks he went on to build the Vostok space capsule used for the first human spaceflight by cosmonaut Yuri Gagarin in 1961. Sputnik Facts - 2: The development of the satellite dated back to the beginning of the 1900's. The idea that a satellite could be put into orbit around the Earth was introduced in 1903 when Konstantin Tsiolkovsky developed a mathematical theory showing that this could be done. Sputnik Facts - 3: In 1948, Mikhail Tikhonravov, an expert in spacecraft design and rocketry, spoke to scientist Sergei Korolev about putting this theory into an actual working device. Experts dismissed the idea but Korolev did not. Sputnik Facts - 4: Russian rocket development programs had focused on missiles, not satellite launch devices. The R-7 rocket was a Russian missile developed during the Cold War, and the world's first intercontinental ballistic missile (ICBM). A nuclear-armed intercontinental ballistic missile was guided in the first part of its flight but fell freely as it approached its target. Sputnik Facts - 5: It was Sergei Korolev who suggested the idea of using the R-7 rocket to put a satellite in orbit in 1954. Using the R-7 to launch an orbital satellite was an inevitable stage in the development of rocket technology. Sputnik Facts - 7: The ambitious Russian space team at first attempted to design an artificial satellite weighing nearly 3000 pounds, nearly 1.5 tons, (which later became Sputnik-3). They quickly abandoned this satellite for a much simpler and lighter design to prove that they could get something into space - it became known as Sputnik-1. Sputnik Facts - 8: Sputnik-1 ended up being only a small, glistening aluminum sphere with four long antennas containing two radio transmitters, batteries, very simple optical instruments and a thermometer. The diameter of the small ball was 22.8 inches (58 cm) and it weighed about about 184 pounds (83 kg). 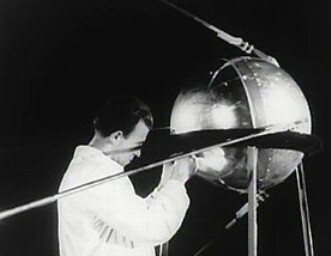 Sputnik Facts - 9: The data transmitted by the first satellite were the internal and external temperatures of the sphere that were used to analyze the spread of radio signals in the ionosphere. Sputnik Facts - 10: The ionosphere is the layer of the earth's atmosphere, between the stratosphere and the exosphere, which contains a high concentration of ions and free electrons and is able to reflect radio waves. Sputnik Facts - 11: A modified version of the R-7 rocket missile was therefore used to place Sputnik 1 in orbit from a launch pad at Baikonur Cosmodrome. The Baikonur Cosmodrome was the world's first operational space launch facility, located in the desert steppe of Kazakhstan. Sputnik 1 was launched into orbit from Baikonur Cosmodrome on October 4, 1957. The following fact sheet continues with facts about Sputnik. Sputnik Facts - 12: The Russian satellite orbited Earth at about 250 km (150 miles) above Earth's surface. It traveled at about 18,000 mph and took just over 96 minutes to complete each orbit of the earth. Sputnik Facts - 13: The shiny aluminum ball was invisible from Earth but Sputnik-1 made itself heard. Its simple series of beeps were capable of being heard by anyone with a ham radio set. The ‘bip-bip’ signals were beamed out by the two radio transmitters at 20 and 40 MHz (15 and 7.5 long wave) which could be captured by radio enthusiasts over the entire world. Sputnik Facts - 14: The launch of the world's first artificial satellite was surprisingly treated as a very low-key affair - everyone was focused on the rockets that carried nuclear missiles (ICBM's). The Soviet president Nikita Kruschev said that he considered it "just another Korolev rocket launch" and the major Soviet newspaper Pravda only published one short paragraph with the news. Sputnik Facts - 15: At the time of the launch Sergei Korolev seemed to be one of the only people who was really excited and realized the importance of the event. Korolev was quoted as saying "I've been waiting all my life for this day!" Sputnik Facts - 16: Soviet and American delegates from the international scientific project (IGY) committees were at a reception at the Russian embassy in Washington D.C. when news of Sputnik's launch came through. The chairman of the American IGY committee, Dr Joseph Kaplan, congratulated the Russians on a "remarkable achievement" but most generally downplayed the importance of the accomplishment. Sputnik Facts - 17: President Eisenhower outwardly responded to the news by saying he was not worried just because the Soviets had "put one small ball into the air". But there were obvious concerns from Congress when they learned that a Russian satellite was regularly passing over America. Sputnik Facts - 18: When the news of the launch of the Russian satellite the American public were shocked and stunned and reacted with both fear and alarm. There were many Americans who were into amateur radio who could hear the satellite's ‘bip-bip’ signals that were a constant reminder of the Soviet's presence above the United States. Sputnik Facts - 19: A lot of people, caught up in the anti-communist hysteria and paranoia, thought that the satellite was some kind of a weapon, or a secret device that the Soviets could use to target American towns and cities with atomic bombs. Sputnik Facts - 20: The technological triumph by the Soviets increased the anxiety of Americans and brought into focus the reality of the Cold War. The American public took it as a sign that the United States was falling behind the Soviet Union in missile technology bringing the risk of nuclear attack even closer. The Soviet Union had staged a tremendous propaganda coup for the communist system. Sputnik Facts - 21: Before America could draw breath about the first satellite launched on October 4, 1957, just a month later the Soviets proceeded with the launch of Sputnik-2 on November 3 1957. Sputnik Facts - 22: Sputnik-2 carried the dog Laika. Whilst the first Soviet satellite had weighed less than 200 pounds, the second spacecraft weighed 1,120 pounds and would remain in orbit for almost 200 days. Sputnik Facts - 23: Sputnik 1 revolved around Earth for three months before being consumed in the atmosphere on January 4, 1958. Sputnik Facts - 24: On ‎February 1, 1958, the United States successfully launched its own first artificial satellite called the 'Explorer' satellite under the US Army's Jupiter project. The Explorer satellite was the first spacecraft to detect the Van Allen radiation belt. Sputnik Facts - 25: The president and Congress reacted to the new space technology by replacing the National Advisory Committee for Aeronautics (NACA) with the National Aeronautics and Space Administration (NASA) on July 29, 1958 in order to coordinate research in rocket science and space exploration. Sputnik Facts - 26: The Cold War Arms Race was joined by the Cold War Space Race and Cold War tensions between the Soviets and the Americans increased dramatically. Sputnik Facts - 27: The Sputnik launch was dramatized in several movies including The Right Stuff (1983), October Sky (1999) and The Iron Giant (1999). Sputnik Facts - 28: A model of Sputnik is displayed in the lobby at the United Nations headquarters in New York. Other replicas are on display at the Smithsonian Museum and at the Science Museum in London. The article on the Sputnik provides detailed facts and a summary of one of the important events during his presidential term in office. 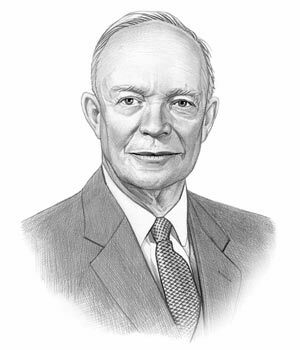 The following Dwight Eisenhower video will give you additional important facts and dates about the political events experienced by the 34th American President whose presidency spanned from January 20, 1953 to January 20, 1961.